Now that longtime vice president David M. Smith has finally left the Human Rights Campaign, Chad Griffin is assembling his team of top advisors and today he announced an Obama Administration appointee will be his chief of staff. Ana Ma, who is listed on the Victory Fund's roster of LGBT appointees is described thus in the HRC release: "Ma identifies as both a Latina and Asian-American." Since identity-politics is a factor here, I have to ask if Ma also identifies as a lesbian because only her two ethnic identities are cited. While HRC mentions Ma's longtime partner and that they are engaged to be married, I would have liked for the release to state she identifies as a lesbian, Latina and Asian-American. Her resume as presented by HRC shows Ma has extensive Democratic Party credentials, and her hiring may indicate the Griffin era at HRC will bring the organization even closer than it already is into the Democratic National Committee's orbit. Wouldn't surprise me in the least if Ma and her labor contacts and her political networks, are put to use to benefit the 2016 Democratic Party candidate president, especially if that candidate is Hillary Rodham Clinton. Always remember that HRC, the organization, shares the same initials with the former First Lady and Secretary of State. 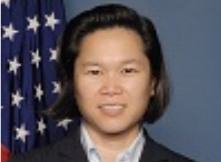 During her tenure as Chief of Staff at the Department of Labor, Ms. Ma worked on issues such as the Workforce Innovation Fund and the reintegration of veterans into the workplace. During the Clinton Administration, she served as a liaison to county and municipal officials across the country and worked in the Office of Employment and Training Administration. “Ana was an integral part of my Administration, serving a vital role as a liaison, administrator and a trusted advisor during my tenure as Secretary of Labor,” said Secretary Hilda L. Solis. Prior to her appointment at the Department of Labor, Ma was Chief of Staff at the U.S. Small Business Administration from 2009-2011 and served as Senior Counsel and Chief of Staff to Congressman Raúl M. Grijalva (D-Ariz.) for three terms. Honey, how could HRC become even closer to the DNC. I always thought it was simply an appendage of the DNC! And, look where its pathologically partisan strategy has gotten us. Everything HRC does henceforth will be seen through the prism of the group laying the groundwork to be the gay effort to elect Hillary president in 2016. You have to look at the entire mix of HRC hiring and the entire mix of its statements and activities to draw conclusions about the direction Griffin is taking. Hiring an Obama appointee at a time when Obama occupies the White House is not a bad thing and it doesn't prove that Griffin is tying HRC to the Dems. If they hire Dem lobbyists to lobby a GOP-controlled House, that is evidence of your thesis. If they fail to speak out when the Dems fall short, that would be evidence. But you have to look at the whole picture.